They're comfortable, but also really bad for you. 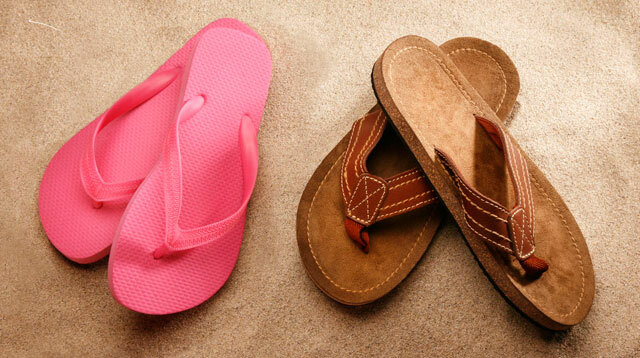 As the weather warms up, it's hard to resist the urge to break out the truest sign of summer: flip-flops. But most experts are horrified by the idea. Here's why you should reserve your flip-flops for the beach, pool, spa, and shared showers—and keep your feet out of them, otherwise, according to Dr. Jackie Sutera, DPM, a podiatrist and spokesperson for the American Podiatric Medical Association. Athlete's foot, an itchy fungal infection that's highly contagious, is spread by contact with something that's contaminated. When you wander around nearly barefoot, you're screwed if this fungus crosses your path. And the same goes for the virus that causes warts, human papillomavirus (HPV). 4. They destroy your heels. Because your heels hit the ground with more force when there's nothing but a measly piece of foam separating your foot from the ground, walking in flip-flops accentuates the heel-strike impact, which could end up causing pain—especially if you stand or walk in them for extended periods of time. 5. They can cause terrible blisters. When a thin strap is the only thing that holds your shoe on, that strap rubs up against your skin every time you take a step. This can cause irritation and blisters. When blisters pop, you're left with an open wound that makes you more vulnerable to the pathogens you pick up anytime your foot is exposed. 6. They can permanently damage your toes. Ever hear of hammertoe? It's when the knuckles of your toes bend. When you wear flip-flops, your toes need to work extra hard to keep the shoe on your foot, which can cause hammertoe over time. If you want to avoid stiffness, pain, and potentially, surgery, you'll stick with strappier sandals (ideally, a pair with a thick strap at the midfoot, and one that goes behind your ankle). Think Birkenstocks and Tevas, which—just your luck!—happen to be trendier than flip-flops. 7. They mess with your posture. Any super-flat shoe that doesn't bend like your foot does when you walk barefoot alters your biomechanics and affects posture. 8. They can cause shooting pains. People with flat feet need arch support to keep their knees, hips, and back aligned. In a flat shoe, there's none of that, so your joints have to compensate. This can cause overuse injuries all the way up the body, including Achilles tendonitis (injury to the tendon that connects the calf muscle to the heel bone), heel pain, and pinched nerves in the back. 9. They can exasperate bunions. Because your toes have to work so hard to keep flip-flops on your feet, over-gripping can aggravate people with unsightly and painful bunions, a bump at the big toe joint. Not good.